As part of your birth support package, you will have a ‘back up’ doula - just in case….. Birth is unpredictable, that’s for sure! In the unlikely event I can’t attend your birth, I will call upon one of these beautiful ladies, Michelle and Mish. Both of these wonderful women have a very similar approach to supporting birth, I trust them to care for you + your partner as I would. We have all trained with either Childbirth International or the Australian Doula College and have completed additional Spinning Babies Workshops. But don’t worry, they won’t be a stranger at your birth! As part of your prenatal education and support you and your partner will attend a group workshop “Practical ways to prepare for labouring at home”. 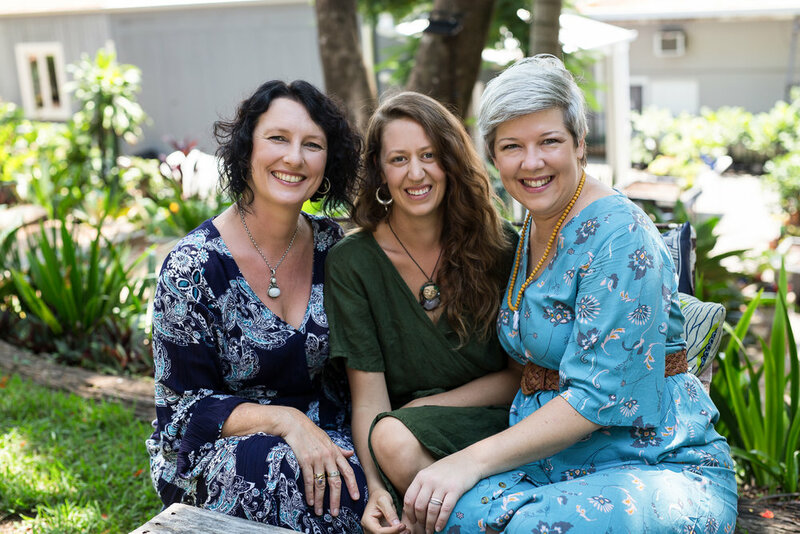 As a Kindred Birth client, you and your partner will be nurtured and supported by 3 Sunshine Coast Doulas - pretty amazing! Michelle’s business “Bliss To Birth” specialises in providing birth doula support and pregnancy, post-natal and remedial massage for women. She works from Coastlife Midwifery in Maroochydore, and from her home-based clinic on her peaceful acreage in Woombye. Michelle has been supporting women in pregnancy and birth since 2012 and is now focusing on expanding her doula services as her family are growing up. She is a wife, mum to 3, step-mum to 2 and nanna to 2 gorgeous grandchildren. Connecting with women and supporting them with their partners to have births that they can look back on with love and joy is her passion! Mish is a Birth Doula, she lives in Dicky Beach with her partner Kyal and their kelpie Digby - they also share their backyard with a hive of beautiful bees which they keep, as well as a flourishing garden. Mish is passionate about providing birthing women, their partners & families with nurturing and educational support to ensure they have a positive and love filled birth experience. She feels very deeply about connecting back with nature and helping woman surrender into their primal birthing power. Mish provides birth doula services and is always working to expand her offerings to women.